In today’s interview, record-holding endurance athlete, Zach Bitter, explains how the high fat diet helped him improve his performance, recovery and longevity. Zach is very passionate about endurance running, finding his own limitations as well as helping others find their own! Today, we get a chance to talk about how he transitioned from a traditionally recommended diet for athletes (that was high in carbohydrates) to a more ketogenic approach, plus, experimenting with a carnivore diet. Zach shares how he adapts his carb load depending on his training demands and uses them strategically to maximise his performance. He believes success on the high fat diet should include some degree of flexibility and there is no one size fits all approach. If you know someone who is interested in how a high fat diet might improve their performance, recovery, and longevity in sport, as well some great ways to start implementing this approach, this interview is for them. I enjoyed this interview with Zach as he shared some valuable tips on how he ensures he is meeting the large energy demands of an endurance athlete on a keto lifestyle. His advice makes a lot of sense; context and timing are vital. As we keep hearing, there is no one single blueprint for all of us; in the spirit of n=1 we experiment and adjust to find the best balance of what works for us. Special thanks to Zach for joining me on the show. Enjoy the episode! To find out more, visit Zach on his personal website or follow him on Twitter, or Instagram. [00:19] – Introducing, Zach Bitter, a world and American record holding endurance athlete who is driven to find his limitations in a variety of environments. He is a three times national champion, three times team USA world 100-kilometre athlete and a coach who loves helping other achieve their best. 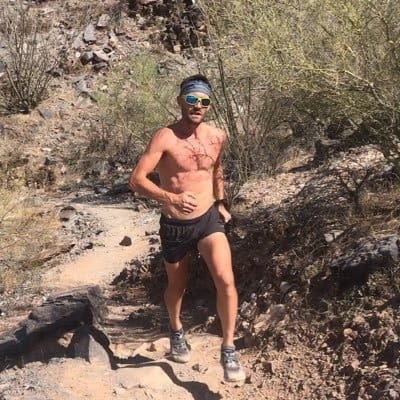 [01:14] – Zach’s latest achievement; he broke a record competing in a Tunnel Hill 100 Mile (162km) race, which he completed in 12 hours 8 minutes, which is technically the fastest 100-mile trail time recorded. [03:31] – Zach shares his journey and what he learned from a dietary perspective. When he first started paying attention to sleep and diet in addition to the training, most training programmes recommended a whole foods high carb diet. After college Zach focused his training on ultra-marathons, but started noticing the toll it was taking on him; experiencing sleep issues and energy swings. He then started looking at his diet and learned about the high fat approach. [08:00] – While sceptical he decided he would give the high fat diet a shot. He explains how, even though there was an adjustment period in terms of his training, he had positive results in terms of sleep and even energy levels pretty quickly. [10:36] – Did he still need a certain amount of carbs due to the amount of training he was doing? The amount of carbs Zach needs ranges depending on where in his training he is. When he is in his recovery period, he keeps carbs low (<5%) following a classic ketogenic approach, but as his training volume increases he needs to up his carbs (usually around 20% but can get up to 30%) in order to keep his performance and motivation at the level he wants. [12:28] – While there were other athletes doing the high fat diet approach, Zach was not aware of the details and he mostly went by the trial and error approach to get to what works and can be sustainable. He wanted to be fat adapted and only use carbohydrates strategically when needed. [15:08] – Carbohydrates that work for Zach are sweet potatoes, potatoes, melons, berries, raw honey etc… Other athletes use other sources and that’s fine, as long as one is timing the intake right and it works well for the individual’s digestion. [15:57] – What is the best timing for carbs? For Zach, what works best is eating carbs just after or the night before a big training session. He gives some examples of his approach and the importance of timing carbs when the time between sessions is short and the energy demand is large. [18:04] – Zach expends a lot of calories when he is training and that needs to be taken into account. Not everyone has the same expenditure. [19:12] – Exogenous ketone manufacturers usually recommend taking them with carbohydrates for sport performance, but Zach has not experimented with this yet. [21:10] – Zach noticed how now that he is fat adapted, he goes back into ketosis after his high carb phases really quickly. Sometimes he even stays in ketosis throughout. [23:10] – Since making the switch to the high fat diet, Zach experienced better recovery and better sleep. Zach explains why diet is worth looking at for athletes. [26:56] – Are there benefits for young athletes starting the high fat approach earlier? It would be interesting to see how someone who started this diet early would respond to training etc… It is also important to consider context as not everybody will have the same goals when training. [29:48] – Zach gets the most of his fat from animal fats, fatty meat is a staple in his diet and he supplements that with coconut oil, clarified butter, extra virgin olive oil and a limited amount of seeds and nuts. [30:52] – Zach has a podcast with Dr Shawn Baker who is a strict carnivore, and explains he is not concerned about having a higher intake of protein (up to 20% or higher) also. Experts Dr Ben Bikman, Professor Stuart Phillips and Dr Ted Naiman all agree protein is not something to be concerned about. [33:10] – In terms of recovery how does diet affect muscle stiffness and soreness or is this down to hydration and sleep. The tightness in the legs does feel best when carbs are lowest, but it can be hard to tease this out as carb intake is highest when training the hardest. One thing he can say is that when his nutrition is good, he is much quicker at getting back into training than previously. [35:35] – In terms of improving longevity Zach also started looking into footwear and now he is not concerned about cushioning of the shoe as he is about the position of the foot. He runs for Altra footwear which make natural running shoes; all flat, zero drop with a foot shaped toe box. It helps to put your foot in a natural position. [38:28] – Zach explains he looks at carbohydrates as a high-octane fuel source. He uses them strategically to optimise his performance and workouts but keeps them under a certain threshold to extend his longevity in the sport and in general. [39:24] – Keeping hydrated is important and with such a large variety of race environments Zach trusts his body to signal him, drinking an electrolyte (salt, magnesium, potassium) solution to thirst. He uses a product called Hydro-X by Xendurance and mixes that in. [43:40] – What does Zach think of Camille’s performance trick of drinking a beer in the final stretch of a race? Is it a psychological boost or is alcohol the bonk (hitting the wall) breaker? [47:20] – In terms of supplements Zack tries to err on the side of caution and takes a multivitamin when he feels he needs it. He also takes an Xendurance product that helps with recovery and some omega-3 supplements. But generally, prefers to get his food source right first. [50:32] – Electrostimulation for recovery or enhancement is not something he tried yet, as he was focusing on nutrition. He would probably look into this if he suffered an injury and wonders if it is more like a band aid solution. [52:28] – For stress management, Zach doesn’t do anything structured, but is aware of his state of mind and tends to drift off into a meditative state of mind naturally. [54:24] – The biggest mistakes Zach sees is when people make a transition at the wrong time in their training or don’t stick with it for long enough. On the other side of the spectrum are the strict kept followers who struggle in terms of performance. His advice is for people to be more flexible with the approach to find what works for you. [56:00] – The best place to connect to all of Zach’s different platforms is through his website. He is most active on Instagram and Twitter. He also works with a group called Sharman Ultra Endurance Coaching, offering ultra-marathon coaching packages as well as providing consults on a one time or regular basis.